Many congratulations to the new Mr and Mrs Collins who were married at the very lovely Ye Olde Plough House, Bulphan, Essex on Saturday 31st May. 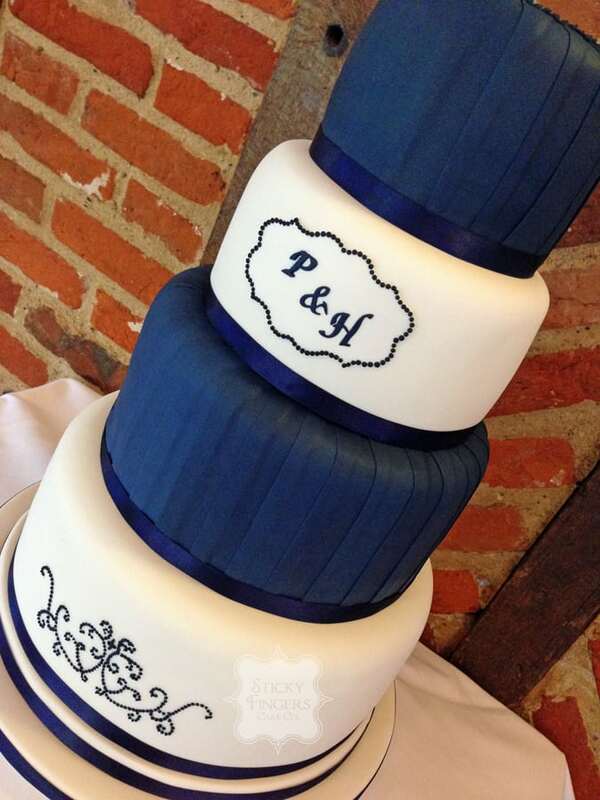 Their colour scheme was navy blue and white so chose to have a navy blue and white wedding cake! Not only that but also chose to have “Blue” Velvet Cake (i.e Red Velvet Cake, but blue instead!) on the inside of the white tiers, so that when they cut into the cake, the navy blue and white theme continued. The other flavours they chose to have were Madagascan Vanilla Bean for the top tier and Lovely Lemony Lemon Cake for the third tier. The piped pattern on the bottom tier was copied from their invitations. Hope Hannah and Pat have a long and happy life together.